What do you call two teenage ants running away to Vegas? Ant-elope! At EcoTech in Minneapolis, MN, we are making sure that your home or office is not their Vegas and the only eloping that will be going on will be outside of your home! If you have an ant problem in your Minneapolis home, let EcoTech take care of it for you today. The real issue with ants is that there is never just one of them. Ants don’t ever fly solo and can range in colonies with up to 500,000 ants in one small setting. No one wants 500,000 ants in their home or place of business, right? Ants can be found around, on, or inside your home. They are attracted to sweet, greasy foods or anything with moisture in it and once you find one, you can almost guarantee that you’ll find another. Unfortunately, this is why you’re over the counter ant sprays just don’t do the trick. Unless you find and remove the colony, you will continuously have an ant problem. For this reason, calling on your local experts at EcoTech will get the job done right, the first time. At EcoTech, we have over 15 years of experience tracking down and eliminating ants. There are numerous different species of ants and therefore, there are numerous different treatments. When you call on Eco Tech, we will come out to your home and diagnose the problem. 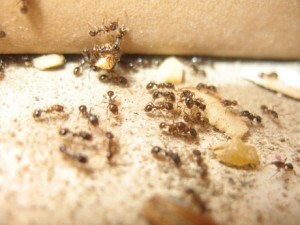 We will assess the species, find the colony, and come up with a plan to eliminate your ant issue safely and effectively. Our experts are trained and proficient in successfully locating the colony and nesting area and then using the appropriate measures to exterminate. Everything we do at EcoTech is meant to be safe for humans and pets as well. Therefore, we will typically use a less toxic, organic product line to get the job done safely and effectively. At EcoTech, we believe the quality of our service and commitment to excellence will keep our customers coming back when they need it. That is why we require no contracts for our services and never ask you to pay for additional services that you simply don’t need. We pride ourselves on offering Minneapolis, MN affordably priced services backed with quality. We offer a four-year warranty on all of our pest control plans. For more information about EcoTech and our ant extermination services in Minneapolis, MN, give us a call today at 763.785.1414.